This is a smoke detector. This is a smoke detector on a 12 foot ceiling or so. This is a smoke detector that was not fun to install. 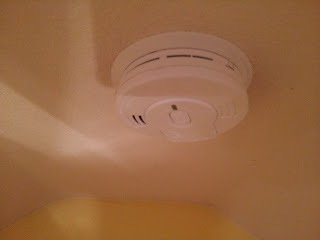 So, just a few months ago, we had the pleasant experience of having a smoke detector go off at 2 in the morning. Not chirping, mind you, but full-on alarm. There was no smoke, no fire. Just alarm noises. A few days later, we had a second smoke detector do the same thing, at around the same time in the morning. Two things I learned from this experience: 1) Children sleep through smoke detectors. 2) When one goes bad, replace them ALL. So, after learning this life lesson, we bought a ton of smoke detectors at the "Depot" and I proceeded to install them all. This one was not nearly as bad as the one I have to lean out off of the stairwell to get to. Oh, and another thing -all of these are front-battery-loading models, so you don't have to take the smoke detector off of the ceiling and unplug it to change the battery. I'd call that a major home upgrade. Since this smoke detector delicious, I have also done several other fun home improvement projects like: Replace multiple light fixtures (no more "this house was built in the 90's" brass lighting) and every ceiling fan, including the 15 foot one on a sloped ceiling. That was fun. There are pictures. Then there was the storm door, a WONDERFUL upgrade to the back entrance to the house, and then we have had a plumber here to replace the kitchen sink and various faucets (I don't do plumbing or climbing on the roof - I have my limits). So now, we just need to have someone come paint outside (and chimney and maybe the fence) while I clean up some paint inside on my remaining days off and our house will be pretty darn close to exactly how we would like it to be for us to live in. And then we can put it on the market. I think that's how this seems to always work according to those I've discussed it with. 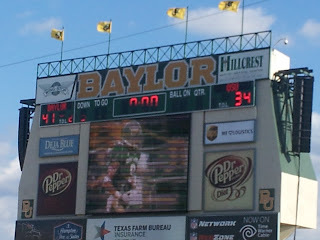 So, this is how my regular season of football wrapped up, watching Baylor beat Oklahoma State at home on Senior Day, and then hanging out for the (well done) montage of Seniors on the big screen. Fiesta Bowl - No surprises, Kansas State here as the champion of the league. Should be a really good match-up with Oregon, and I'll be happy to see this game. Sugar Bowl - Why is this here? The Sugar Bowl didn't pick a Big 12 team. EXACTLY. For the second year in a row, the Sugar Bowl turned its nose up at the Big 12 to take a random other conference in as SEC fodder. Last year's turning of a blind eye to Kansas State bumped the rest of the league down, and this year, Oklahoma gets left out in the cold. Oh well, I guess they didn't want to front-load the Big 12/SEC matchups, since that's the tie-in that they have going forward. Alamo Bowl - Not surprising, picking Texas. Should be a good draw to San Antonio. Buffalo Wild Wings Bowl - I'm not surprised to see TCU picked here, though originally I had thought Oklahoma State would be hanging out here before any of the 7-5 teams. I guess their lackluster finish destroyed their bowl pickability? When two 7-5 private schools are picked up above 8-4 Ok. State, something gives.. I will enjoy the TCU vs. Michigan State matchup though. Meineke Car Care Bowl - Well, like I jsut explained, Houston was going to pick up a Texas school in my opinion, and with TCU & Baylor gone, they'll take Tech's high/low yo-yo team with a potential for an explosive offense to match up against what little offense Minnesota will bring to the table. New Era Pinstripe Bowl - Certainly Oklahoma State will...what? Oh yeah, West Virginia was a shoe-in in my mind for this since the second they got bowl eligible. The thought of WVU-Pitt had some drooling, but we'll take WVU-Syracuse anyway. Heart of Dallas Bowl - Ok, I seriously thought there'd be a Texas team from the 7-5 crew here, or maybe Iowa State would jump in, but no... Oklahoma State picked vs. Purdue. Again, I did not see in my wildest dreams every 7-5 team in the Big 12 picked before Oklahoma State given they had a better conference record. I could insert my comments about Gundy's hair or other tasteless jokes here, but I think I just did. Liberty Bowl - There was no doubt that all our bowl-eligible teams would find a bowl, and Memphis is a fun city - here's hoping my Iowa State friends find some fun on Beale Street. I'm not going to say I'll be glued to the set for the Tulsa matchup, but it could be a good game. And finally, Baylor finishes strong, and ends up with a nice trip to San Diego in the process. Good deal.